Bake My Day! 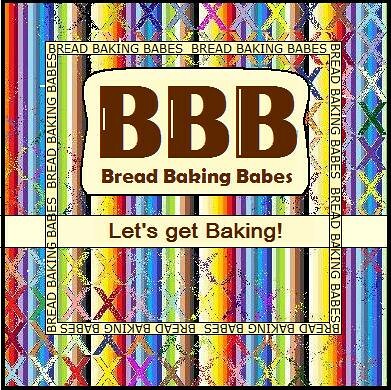 : Bread Baking Babes bake Ensaïmadas! Bread Baking Babes bake Ensaïmadas! It's my turn again! Can you believe we are heating up our ovens for the third year being Babes? The sweet little bun we're going to make this month is called Ensaïmada and it's said that the origin dates back to the 17th century. Ensaïmadas are made in a lot of Spanish speaking countries, Spain obviously but also the Philipines and Puerto Rico. An inconspicious looking pastry-like bun which will reveal it's little secret once torn (or bitten into). Why this choice? Purely coincidence. At the time I was reading a book called "The Shadow of the Wind" by Carlos Ruiz Zafón. The main character is the son of a bookshop owner he is introduced - as a kind of "coming of age" ritual- to the Cemetery of Forgotten Books (the description of that place makes you want to go there, a mammoth labyrinth with intertwining lanes and aisles and aisles of books....) where old forgotten books are kept to save them. As part of the ritual he has to choose and save a book and make it a part of his life. Well, he does make it part of his life. And how! ""I was raised among books making invisible friends in pages that seemed cast from dust and whose smell I carry on my hands to this day."" Somewhere in this book the boy is treated to Ensaïmadas. Mental note to self: look up what they are. Several days later I was browsing my reader and what came up? A recipe for Ensaïmadas! So that concluded it. This was going to be the February challenge. Add the flour together with sugar and salt into a large bowl (I used my KitchenAid bowl) and mix well. Make a hollow in the center, add the crumbled yeast as well as a decent pinch of sugar and pour over just enough of the lukewarm milk until the yeast is covered. Stir the yeast milk once or twice, then cover the bowl with a kitchen towel and let rest for about 15 minutes or until the surface of the yeast milk looks bubbly. Add the other ingredients (the remaining milk, eggs,olive oil ) and knead well, either by hand or with your kitchen machine until the dough comes together nicely. I used less milk in the beginning (200 or 220 ml, while the original recipe suggests 250 ml) and my dough still turned out pretty sticky, I therefor added a tad more flour and let it knead at medium speed for 3 minutes (just for the record: my dough still felt sticky). Let the covered bowl rest again in a warm place for at least 30 minutes or until the dough has doubled. Punch it down softly, then flip the dough onto a well-floured surface and sprinkle with flour. Cut into about 10 equally sized portions and form into neat little balls, before letting them rest – sprinkled with flour, covered with a kitchen towel – once more for at least 30 minutes. Coil up each dough piece until it resembles the house of a snail (tuck the outer end under), ideally very loosely, because any spaces will fill up as the dough rises further. Place about five Ensaimadas on one baking sheet, making sure to leave enough space between them. Lightly brush with lard and cover up again. The final rise is supposed to last overnight, yet I baked mine in three different batches (with rising times of 1 hour, 4 hours, 13 hours) and we preferred their look and taste with shorther rising times (1 and 4 hours). But do as you like. Preheat the oven to 200°C (~390° Fahrenheit) and bake for 14 to 16 minutes or until golden brown. Take out and let them cool down on a wire rack for a couple of minutes, then generously dust with powdered sugar and enjoy while still warm. - like Nicole I did hold back on the milk, using just the 200 ml and got a nice soft dough, not sticky just a bit tacky. I think that I might have gotten away with using slightly more milk because I would have liked to roll them even thinner. I let mine proof for an hour/hour and a half with great results. The amount of yeast used is quite a lot for the flour so they'll rise nicely anyway. - I used cinnamon/sugar butter in some of the rolls, goose fat in others. Couldn't resist to make a larger one filled with red grapefruit curd. - They are real fluffy and light, think of the croissant-family with soft layers instead of the crisp flakiness that a croissant has. Love that layering inside. My kids inhaled them! To guide you on your way to lovely buns with fluttering innards some youtube rolling. Again, blogroll on the right hand side to go and visit my Bread Baking Babes, see how they rolled! If/When you would like to become a Bread Baking Buddy and earn your own Buddy Badge to show in your post please bake along with us and make this bread and post before or on Thursday 25th February. Send me your name and the name of your blog with a link to the post (bakemyday AT gmail DOT com) and I'll send you the Buddy Badge asap and show a round up here on Thursday 25! You can read all about being a Buddy in this post. 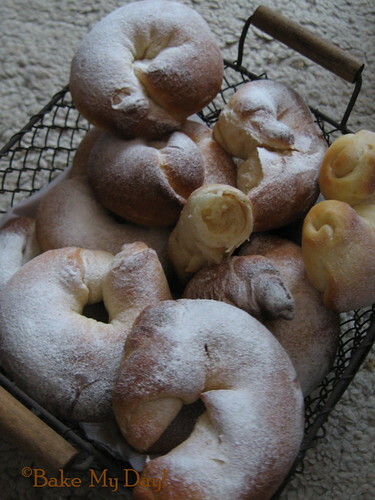 They look so wonderful, I'm really looking forward to bake them... I'll just be a few days late. As I am always such a good girl you won't mind, right?! Wow our third year started already! time flies when you baking fun. Lovely! I love all the history and romance around these too. Thanks for such a delicious challenge! Aaw, I couldn't make it in time either! But they are so adorable and they seem so yummy so I just have to make them very soon. And three years! That's amazing!! These were great! I loved them and ate practically the wholelot myself (not all in one sitting). And I love that book, too! My sister says Ruiz' new book is wonderful! These were so tasty! Thanks for picking this fun recipe. My family loved them! @ Lien: Of course I won't mind! You'll need some breathing space after all those stomach bugs running amoc in your house. I bet these buns are great kid-pleasers! @ Görel: it is amazing isn't it? The things we shared, the fun we had.. It's been so much fun! @ Katie and Lauren: the book is one of those that grabs you and slowly pulls you in in a world of it's own. @ Lynn: They sure are a crowd pleaser, especially when that crowd consist of young people.. I made lots of small ones and only 4 of them lasted for another day! The recipe sounds amazing, especially with the cinnamon sugar butter inside. I'll definitely try that version!!! Also, I don't have any pork lard on hand and I already did my weekly grocery shopping, so I'll use goose fat instead. Lovely choice of recipes Karen! I can really see the dough layers in your photo and love the fillings. Must make time to be a Buddy on these. Delicious! @ AP: actually I really liked the buttered ones best so.. no trouble there! @ Elle: I love to see yours Elle, these are fairly easy to put together and don't take up much time! we liked them a lot over here and we praise your choice for the challenge! Thanks for this fun-to-make bread ! 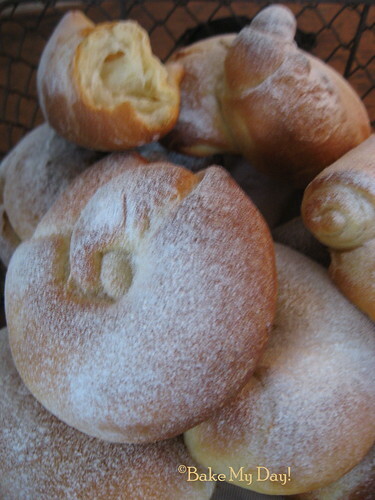 I'll stick to sweet fillings or just butter in the future,the bread is too sweet for savory ! THese were delicious! I love the thought of curd baked into them. Yum! Great choice, I am glad to have made them and hope to again as well! Very cool how you decided to make the rolls! And don't they look delicious? Okay, now I'm going to have to look for the book, sounds like a great read. Love your ensaimadas! This was a fun challenge, thanks for a great topic! thanks for finding such an interesting, fun and delicious recipe for us! No it hardly seems possible that we could have been crazy baking these three years in our Babe Kitchens with such grand buddies! This was a wonderful choice Karen. It's so pleasing to discover bread in all it's guises with this group. Thanks for such fun times.